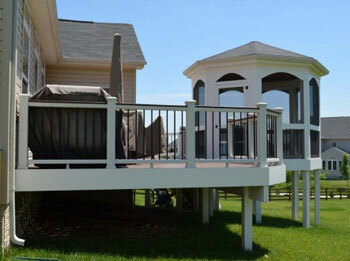 Distinctive Deck Designs is Mark Shriner and David Tingle. Together they are a dynamic team of distinguished and proven professionals with over 20 years experience in home building and the construction of outdoor living areas. Mark Shriner has been an integral part of the area's finest home builders including Winchester Homes, NV Homes, Van Metre Homes, and Comstock Homes. Having exceeded corporate production objectives for home building excellence, Mark went on to supervise the construction of a few of the regions most renowned communities such as Balmoral at Clifton and The Estates of Great Falls. Out of more than 250 local contracting organizations, Mark has been awarded as one of the Top 20 Quality and Safety Contractors in 2005 by Winchester Homes. He has completed workshops and professional education courses in Quality Management by Ed Calderia Company which applies the ISO 9000 Principles to Building Contractors. Ed Calderia is the author of Quality Systems Implementation published by the U.S. Department of Housing and Urban Development. 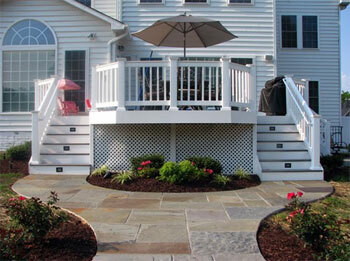 David Tingle, Master Designer and Lead Carpenter, has been building decks and porches for 20 years in the Northern Virginia. He was Mark's deck contractor of choice while managing many of the areas premier new home communities including but not limited to Balmoral of Clifton, Fairfax National, and the Estates of Great Falls. David's unparalleled expertise makes even the most challenging tasks seem simple and well defined. With formal education in architecture and drafting, he is an accomplished master artist of decks and outdoor living design. These two team leaders, experts in their craft, merged in the year 2000 and now spearhead all operations in what is known as Distinctive Deck Designs.